On “Star Trek: The Next Generation,” Captain Jean-Luc Picard often pondered the week’s signature conundrum over a cup of comfort. Christensen is the KUKA chair of robotics at the College of Computing at Georgia Institute of Technology and the executive director of the Institute for Robotics and Intelligent Machines. He collaborates with the likes of Apple, BMW, Electrolux and others. “Very cool” is a pretty stellar review. It might be a decade or more before COOKI’s robotic arm is whipping up a staff lunch in your warehouse’s break room, but its bigger, burlier cousins will likely be out on its floor well before then. Robotics and automation is moving forward at veritable light speed, and the laws and regulations governing their use are finally catching up to the technology. 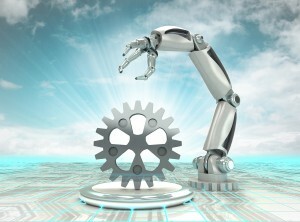 In 2015 robots will not only be streamlining the process and facilities of the supply chain, they’ll be working right alongside their human co-workers (and keep right on going when everyone else heads home for dinner). Helping companies produce and/or deliver goods faster, says Melton, allows them to be competitive and grow. He cites FANUC client Noble Plastics, a Louisiana-based operation that has continued to expand—and hire—as they’ve implemented robotic automation. FANUC also helps Noble train employees to work in the new environment.